A team from the University of Reading, as part of the CGIAR Research Program on Climate Change, Agriculture and Food Security (CCAFS) research work is scaling out a novel approach to support smallholder farmers in several countries. Participatory Integrated Climate Services for Agriculture (PICSA) involves agriculture extension staff working with groups of farmers ahead of the agricultural season to firstly analyse historical climate information and use participatory tools to develop and choose crop, livestock and livelihood options best suited to individual farmers’ circumstances. Then soon before and during the season extension staff and farmers consider the practical implications of seasonal and short-term forecasts on the plans farmers have made. The project works directly with National Meteorology Agencies, government extension agents and non-governmental organisations. The project was first piloted in Zimbabwe and then in Tanzania and Kenya. It is now being scaled out in Ghana, as part of the CCAFS supported CASCAID project, Tanzania and Malawi via the Global Framework for Climate Services (GFCS) project and Lesotho via International Fund for Agricultural Development (IFAD). 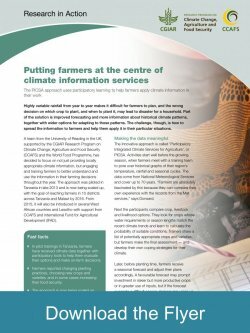 Improved climate information and decision-making tools enable small scale farmers in the target countries to improve their resilience in the face of erratic rainfall and increasing temperatures. Capacity of Meteorological Agencies to produce relevant products that are useful for smallholder farmers’ is increased. Extension and NGO staff are able to facilitate farmers to use complex information on historical climate, seasonal and short term forecasts and crop, livestock and livelihood options in decision making. 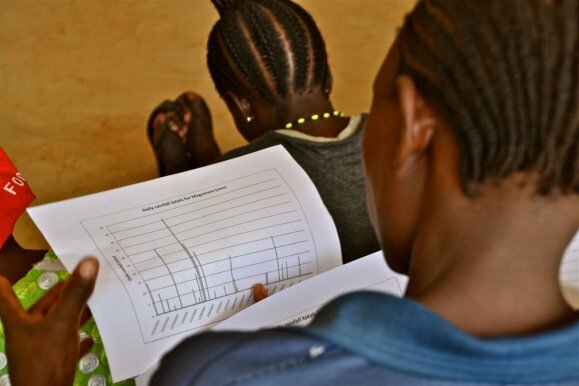 To date in Tanzania, more than 100 Extension and non-governmental organisation (NGO) staff have been trained and are working with farmers in Zimbabwe; 224 extension staff were intensively trained in an initial phase, followed by a further 1,023 staff. The Rockefeller Foundation funded training by Reading of 24 key staff from NGOs and Meteorological Services from Kenya, Tanzania and Ethiopia. Seven National Farmer Organisations from Niger, Mali, Burkina Faso and Senegal received training from Reading in December 2012 - funded by the Mcknight Foundation and CCAFS. The World Meteorological Organisation has promoted scaling up of training as a component of a new e-learning course by University of Reading (currently being taken up by over 200 participants from 5 countries in Africa). The dissemination and training have directly resulted in a range of NGOs and national organisations adopting the approach or aspects of it including Oxfam in Ghana, Farm Africa in Kenya, Practical Action and World Vision in Zimbabwe. Development of a "PICSA app". Following a scoping study on relevant ICT based weather and climate apps the team from UoR will develop and pilot an mPICSA app. The project is led by University of Reading, and the team works together with local partners, such as World Food Programme (WFP) in Tanzania and Malawi and Oxfam and the Adventist Development and Relief Agency (ADRA) in Ghana; local research institutions including Agricultural Research Institute (ARI) in Tanzania and African Institute for Mathematical Sciences in Ghana; and importantly the national Meteorological Agencies in each country. The project is part of the Global Framework for Climate Services (GFCS) Climate Services Adaptation Programme in Africa as well as CASCAID in West Africa and Wool and Mohair Promotion Project (WAMPP), supported by International Fund for Agricultural Development (IFAD) in Lesotho. Both women and men farmers will be better equipped to explore a variety of crop and livelihood management options that relate to their individual circumstances and location. The use of PICSA will contribute to improved capacity to plan and cope with climate variability for both genders. For further information, please contact the Project Leader, Peter Dorward (p.t.dorward@reading.ac.uk). Could this be the game changer in climate information services innovation?